Just finished watching "The Tooth fairy" and now eating pizza from Sharron. 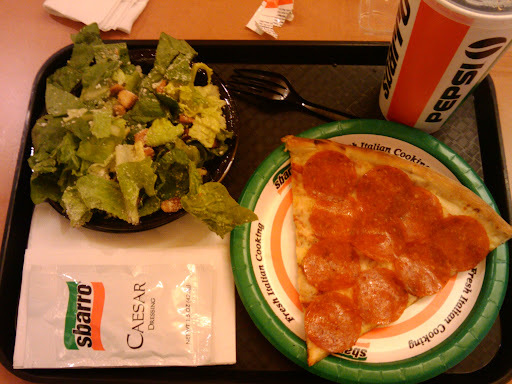 $7.29 for a slice of pepperoni, Caesar salad and a soda. A bit on the high side, but I guess that's eating at the mall. Update: I would have liked to have seen a bigger slice for the price, and I would have liked the pepperoni's to have been a little more done. The crust was good, but it looked like they made and fully cooked a cheese pizza, then threw some pepperoni's at it. The short time in the oven to reheat the slice did little more than soften up the pepperoni's. This trip was not worth the price paid. I share the feeling that the price is high. Now that they stopped selling the chicken parmesagn, I quit going there. Maybe I'll have a slice for old time's sake. Just make sure if you get a pepperoni slice they leave it in the oven long enough to cook them. That would have made a big difference.